They are. I know. You may think yours are better, but you have to try these and compare before deciding. Mom’s recipes always come through. Sometimes a baking powder biscuit sounds too good to resist. Do you know what I mean? Finding an excellent one has been the challenge. That is, until I happened to find my mother’s old recipe stashed in one of her cookbooks. I was so glad to find it. It wins, hands down. 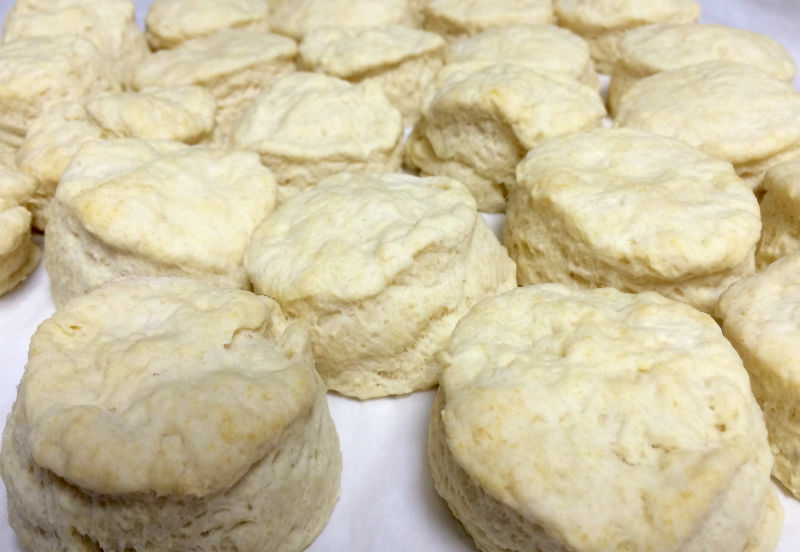 The mix is easy to handle, the biscuits come out light and fluffy, and they are just moist enough. Now I can ditch the rest of my trial recipes. Guess I should have known mom’s would be the best. That is nearly always the way. I’ve experimented with buttermilk, with coconut oil, and a variety of others, but many times they tasted dry, too hard, or too crumbly. It is a common thing to make. You can buy bisquick even, but it feels smart to make them with ingredients I already have. The taste confirmed that decision. Serve them for breakfast with butter or jam. Frost them with a powdered sugar glaze. Add some cinnamon to them for a sweeter treat, like this recipe shows. Of course, they are wonderful served with lunch or dinner instead of a roll. I made a double batch this time so there would be plenty to freeze for another day. Just pull out as many as you need and let them thaw, or warm them for seconds in the microwave. They stay tender and moist. Oh! I almost forgot, the Ninja made blending the butter/shortening and flour a cinch. You can use a cutter but it might be worth the cost of the ninja master prep just for tasty treat like this. It works on so much more, you will be amazed. I still haven’t found a job it can’t do well. If you want to see photos of it in action, check out my review here. Cut in ½ cup shortening or butter with a pastry cutter until mixture resembles coarse crumbs. (If using a Ninja combine, then pulse for 10 to 15 seconds). Stir until dough follows fork around the bowl. Dough should be soft and easy to handle. Turn dough onto lightly floured surface (parchment works great for this). To knead, fold dough and press down gently with heel of hand 8 to 10 times. This will blend ingredients and assure fine texture and plump biscuits. Flatten with hand or rolling pin to ¼ to ½ inch thickness. Cook for 10 to 12 minutes. The biscuits should be lightly brown on the bottom. Don't overcook. If you want to make drop biscuits, increase milk to 1 cup, then drop onto cookie sheet and bake.